Home > COMET INDUSTRIES BELTS > COMET 200421 (A-DF), Comet Industries belt replacement for TC88 Series, 883-80 Go Kart belt. COMET 200421 (A-DF) - Replaces original Comet 883-80 for TC88 Series. Go Cart Belt #200421. 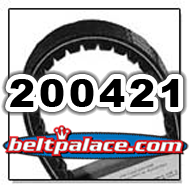 COMET 200421 (A-DF), Comet Industries belt replacement for TC88 Series, 883-80 Go Kart belt. Comet 200421 (A-DF) Go Kart Belt. Replacement belt for Comet Industries TC88 Series. COMET 200421 and 200421A. Symmetric 5/8” W x 29-9/32” L. Cogged belt. For use with TC88 Series CTC distance settings with 6" Driven = 7-9/16” to 7-5/8” or 7” Driven = 6-13/16” to 6-7/8”. Supersedes Comet 301080A Belt. Comet 200371A "Black" TC88 Series Spring (for 6" or 7" Driven Clutch). Replaces "black" tension spring in Comet 88D6 and 88D7 Driven Clutch (Lower).